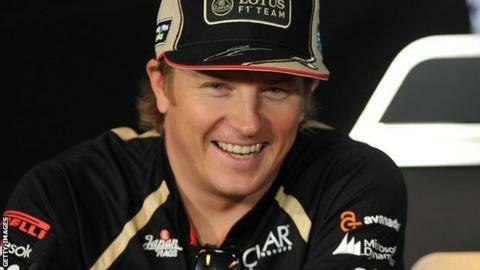 Kimi Raikkonen will remain in Formula 1 with Lotus for the 2013 season. The 32-year-old Finn, who won the world title with Ferrari in 2007, returned to the sport this season having spent two years competing in world rallying. He signed a two-year deal but needed to satisfy performance clauses to remain with the outfit for a second campaign. "Lotus were always going to keep hold of Kimi Raikkonen for 2013. The 2007 world champion has had a strong season on his return from two years in rallying and he was under contract. "Raikkonen's deal locked him in for a second year if he and the team achieved a certain position in the championships by a specific date in September, which they did. "There is no doubt his return has been a success - his excellent consistency has put him third in the championship, ahead of both McLaren drivers. "However, there is also a slight sense of what might have been. Until they started to be left behind on development by the top three teams a few races ago, Lotus looked certain to win a race, but it never quite happened. "Part of the reason why it didn't was that Raikkonen started too many races from further back than he should have done after mistakes in qualifying." "I think my return to Formula 1 has gone pretty well," said Raikkonen. "I didn't expect to be fighting for the drivers' championship this season." Raikkonen is third in the drivers' standings but trails championship leader Sebastian Vettel of Red Bull by 67 points with 75 on offer from the three remaining races. The Finn has scored points in all but one of the 17 races so far this season, including six podiums. He added: "It has been great to be on the podium so many times and to score points on a regular basis. "I feel very comfortable with Lotus F1 Team and we share the same philosophy of racing. Continuing with the team was an obvious choice for me." Team principal Eric Boullier said: "Kimi has made an exceptional comeback to Formula 1. "For Lotus F1 Team to be fighting for such strong championship positions this year is in no small part attributed to Kimi's talent and experience of racing." The Finn entered F1 in 2001 with Sauber, raising eyebrows when scoring a point on his debut at the Australian Grand Prix. Raikkonen spent five years with McLaren before joining Ferrari in 2007, with whom he won the title in his first season. But, after struggling in the next two seasons, he quit Formula 1 for the World Rally Championship. In two seasons with Citroen, his best result in a rally was fifth. The Finn was tipped for a return to McLaren in 2010 before negotiations broke down over money and team boss Martin Whitmarsh instead turned to Jenson Button. But last November he returned to F1 by signing for Lotus - then known as Renault.